“The Clifford Hugh Douglas Institute for the Study and Promotion of Social Credit” is a Canadian not-for-profit organization which is dedicated to: a) increasing the public’s general awareness of Social Credit ideas by disseminating, both nationally and internationally, complete and accurate information regarding the content of the Social Credit vision for society and to: b) serving as a resource centre and relay point for those individuals and groups who wish to work under the Institute’s banner (and hence, in a co-operative, law-biding, and non-violent manner) for the introduction of Social Credit policies and mechanisms in the economic and political life of their respective nations. The C.H. Douglas Institute relies exclusively on donations from generous Social Credit supporters and sympathizers in order to finance its operations and to maintain its internet presence. Those interested in donating may do so on this site via the paypal donate button (please refer to the blue button on the right or to the navigation bar). Since part of the Institute’s activities are political in nature, the Institute, while federally incorporated, is not eligible for charitable status and thus donations are not tax deductible. 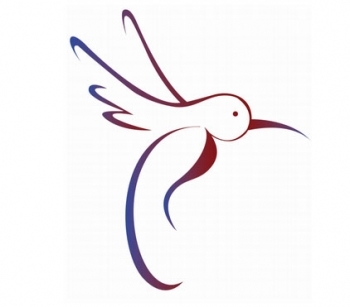 A stylized hummingbird was chosen to represent the Institute and its associates. Hummingbirds are rather unique creatures, given their ability to fly vertically (up and down), horizontally (left and right), backwards as well as forwards, to stop suddenly in full flight, and to hover over an extended period of time. Their wings are said to beat in a figure 8 or after the pattern of the sign for infinity and equilibrium. This extreme flexibility of movement in combination with their constant dependence on flowers for nectar (which also allows the flowers to be pollinated) symbolizes the sort of isomorphic relationship which the financial system should have with regard to the real economy. The financial system should operate as nothing more than a dutiful (and hence adaptable) servant of the desire of individuals to actualize and enjoy the real credit of their societies. In the same way, the political system of a country should be designed in such a way that it effectively delivers, with the least amount of trouble to everyone, the intended fruits of political association: security, abundance, and liberty. Hummingbirds also symbolize joy, independence, freedom, fearlessness, miracles (grace), cause and effect, the ability to explore and draw from the past while looking towards the future, the idea that work, of whatever kind, should be a deeply satisfying activity (all the humming that these birds make while flying is not for naught) and accomplishing the apparently impossible. All of these aspects of reality are key components of the Social Crediter’s ‘vector of aspiration’. Who was Major Clifford Hugh Douglas? The Institute is named in memory of Clifford Hugh Douglas (1879-1952). C.H. Douglas, otherwise known as Major Douglas, was an Anglo-Scottish engineer of some repute. Educated at Cambridge, Douglas had occupied a number of important posts throughout the world in the course of his career. He had worked for the Canadian General Electric Company in Peterborough (Ontario), as Assistant Engineer with Lachine Rapids Hydraulic Construction (Québec), as Deputy Chief Electrical Engineer for Buenos Aires and Pacific Railway (Argentina), as Chief Engineer and Manager for the British Westinghouse company in India, and as Assistant Superintendent for the Royal Aircraft Factory in Farnborough (England). He acquired the title of Major while serving in the Royal Flying Corps during the First World War and retained that rank in the R.A.F. reserve. As a direct result of his professional work and life experience, Douglas made a number of startling discoveries concerning the nature and operation of the financial system in modern, industrialized economies. Building on these findings as an initial core, he went on to elaborate at some length on that set of interlocking philosophical, economic, political and historical ideas which would eventually become known as ‘Social Credit’. His early retirement from engineering (made possible, no doubt, by his proficiency in his chosen occupation) enabled Douglas to devote himself full-time to the Social Credit cause. During the 1920’s, 30’s, and 40’s he was the focal point of a world-wide movement that had been sparked by his various writings and addresses, a movement that continues in existence to the present day. During this early period, Douglas’ renown was so great that he was invited to present evidence before the Canadian Banking Enquiry in 1923, before the British Macmillan Committee in 1930, and before an Albertan legislative committee in 1934. He was also invited to embark upon several foreign trips, visiting with and addressing various, and sometimes very large audiences in Australia, Canada, Japan, New Zealand, Norway, and the USA in an attempt to further spread the Social Credit message and to mobilize his following. Douglas’ efforts were not without fruit. In 1935 he was appointed Chief Reconstruction Advisor to the Government of the Canadian Province of Alberta, a province which went on in the same year to elect the first official Social Credit Government that the world had ever seen. It is the ardent desire of the Institute and its associates that one day, in the near future, C.H. Douglas will be given due credit for the great wisdom and knowledge which he has bequeathed to the human race. Of course, no greater honour could be given to him than for his Social Credit principles and mechanisms to be finally adopted by economic, political, and cultural associations the world over. It is for the sake of seeing this task to its fulfillment that the Institute exists.